Alot of persons where thrown in a state of confusion when photos of actress, Halima Abubakar surfaced online earlier this year with her head fully shaved making her look like someone battling with cancer. 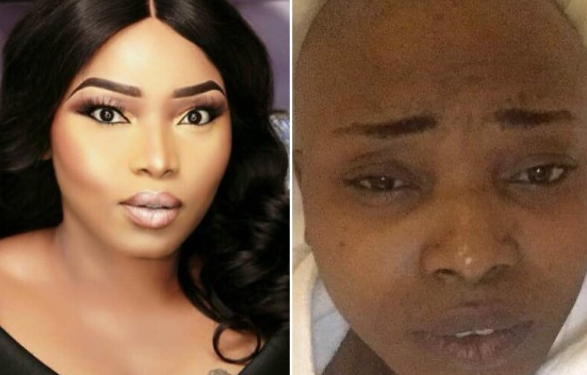 However, the actress has indeed came out to speak on what many persons perceive as cancer in an interview she granted to Sunday Scoop. According to her, she was suffering from aftermath of the fibroid operation she had earlier this year. Thankfully, it seems the worst of the storm is over for Halima and she is back to her bubbly self. In an exclusive chat with Sunday Scoop, she stated that she had resumed work. “I am back on set fully. As a matter of fact, I am currently in Accra where I went to work with Pascal Amanfo. I was on set with Mercy Johnson and some other actors,” she said.